Silent films are, for most of us, part of a quaint and distant past. In flickering black and white, accompanied by piano or organ, plots unfold via the exaggerated physical movements of the actors, and ornate “intertitles” that convey dialog and other information to viewers. In her second collection of poems, Becoming Lyla Dore, Teri Youmans Grimm manages to take her readers back to that past and make it live in the present. 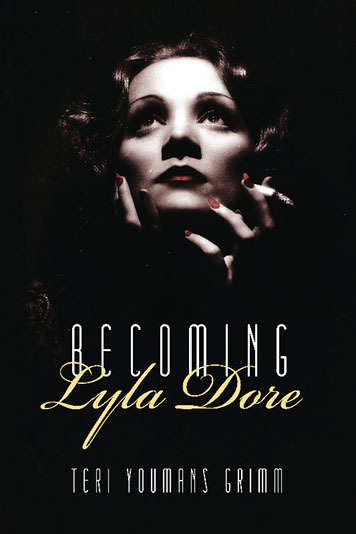 The Lyla Dore of the collection’s title is a fictional character, created from an amalgam of early film stars. More than just a narrative thread running through the collection, Lyla’s story is a fictional celebrity memoir—at once a life story and a reflection of the cultural history of an era. Indeed, the collection reads like a novel, and a pager-turner at that. When asked by an interviewer why she wrote the book as poetry, rather than a novel, Grimm said simply, “I am a poet.” She also referred to the compression that poetry requires as helping her to get to the heart of the story. The visual nature of lyric poetic imagery, quick cuts, pacing, spacing, and room for mystery will make sense to the reader as a vehicle for the story. The poems, all in first person, are structured in a variety of forms with long and shorter lines, couplets sometimes, unbroken columns, or other arrangements on the page that make for visual interest. In this collection, as in her earlier collection, Dirt Eaters, Teri Youmans Grimm shows herself to be very skilled at writing about people, whether she is creating vivid characters from whole cloth, or choosing the details that will make Aunt Ater from Grimm’s own family interesting to her readers. Grimm, a fourth generation Floridian, placed Lyla’s childhood in Jacksonville, once the home of thirty film studios and known as the “World’s Winter Film Capital,” it was Hollywood before Hollywood. Grimm’s prodigious research into the public history of the silent film industry stands behind the personal history that she created for Lyla, and her use of real people as characters in Lyla’s tale is very effective, keeping readers poised on the cusp of reality. In fact, the reader will find an ongoing contemplation of what is real and what is illusion to be a significant part of the act of reading this book. into a hole and the lake reacquainting everyone with blue. myself on fire, if it meant the world could see me better. I made some good choices, wise investments. There are many such moments of both light and dark to be savored in Grimm’s poems as we move through the life of Lyla Dore, and in parallel, the history of silent films, arriving finally at the end of both. little planet of nitrate and silver. could subsist on light and adulation. Kali Lightfoot lives in Salem, MA. Her poems have appeared in several journals, an anthology, and won an Honorable Mention from the Science Fiction Poetry Association. She has written reviews of poetry for Bookslut and Green Mountains Review.